An Orbital ATK capsule carrying supplies and experiments has docked with the International Space Station (ISS). 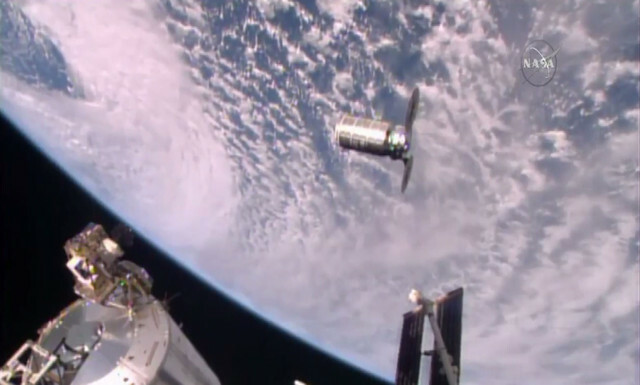 Using the space station’s robotic arm, Japanese astronaut Takuya Onishi and U.S. astronaut Kate Rubins successfully captured the unmanned Cygnus spacecraft, operated by NASA commercial provider Orbital ATK, at 7:28 a.m. EDT (1128 GMT), the space agency said. The spacecraft will be installed to the orbiting lab’s Unity module and stay there until Nov. 18. This flight was Orbital ATK’s sixth official mission to the ISS for NASA under a commercial resupply services contract. Among the 5,290 pounds (2,400 kg) of cargo aboard Cygnus were numerous science experiments, including one that will study how flames grow in space. But the fire experiment will occur after Cygnus leaves the ISS and before it re-enters Earth’s atmosphere. Cygnus was launched on the company’s upgraded Antares 230 rocket from Virginia’s Wallops Flight Facility on Monday. It marked the first flight of the rocket, and the first launch from Wallops since Antares’ predecessor and the cargo ship it was carrying were lost seconds after liftoff in October 2014. The Virginia-based Orbital ATK is one of two U.S. companies that provide ISS cargo services for NASA. The other company is California-based SpaceX.